The term “eco-friendly” has been around for so long that its true meaning is in danger of being lost. It is often used by advertisers in an attempt to appeal to environmentally conscious purchasers and is applied to all kinds of unlikely products from cars to detergents. Eco-friendly homes on the other hand offer the opportunity for people to live in such a way as to minimise their impact on the ecosystem. In its purest form the eco-friendly house would have zero effect on its immediate surroundings, the environment and on planet Earth itself. In practice such a lifestyle is all but impossible unless we consider living in a shelter constructed from twigs and leaves, ethically produced of course, with no amenities. 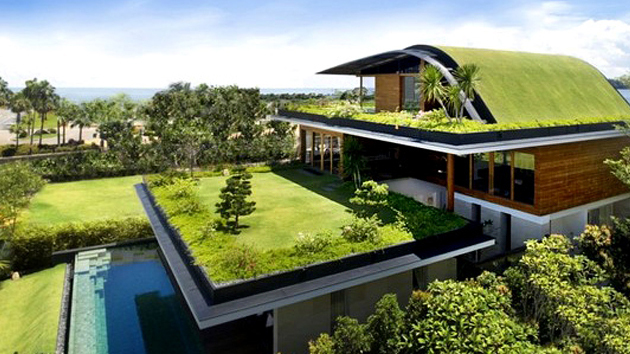 Unsurprisingly, few of us would wish to revert to nature in this way and so the eco-friendly home must provide all of the comforts that we have come to expect in a package that has minimal impact on the planet. One of the first considerations is that all forms of potential pollution should be avoided and one of the first is the atmosphere including the biosphere and the more distant ozone layer. Any activity which could potentially cause damage to the ozone layer, including the production of carbon dioxide, must be carefully managed and, to this aim, a true eco-friendly home will have a very low energy requirement and in some cases may even be energy self-sufficient. Such simple design considerations as location and orientation can maximise the benefit of sunlight by large south facing windows with high levels of insulation preventing excessive heat loss. Traditional heating systems rely largely on the use of fossil fuels which in turn deplete the earth’s natural resources and often contribute to the home’s carbon footprint. Even fully electric systems use energy derived from a possibly polluting power station and so the eco-friendly home usually employs a low energy system such as a heat pump which works on the same principle as a refrigerator motor with heat being taken from one location and released at another. Some properties may be able to utilise ground or water heat sources whilst others have to rely on air-based systems. Water is another consideration and, although not strictly a finite resource, water supply is limited due to the infrastructure and there are many advantages, including financial, in reducing water use. Eco-friendly homes often use systems of rainwater collection for non-potable use such as flushing toilets. Drainage from the property should also be designed to have minimal impact with natural percolation being preferred to the use of large impervious surfaces needing water to be piped away possibly adding to localised risk of flooding. Another consideration is that, wherever possible, energy should come from a renewable source. The installation of solar panels for water heating and electricity generation are perhaps the most obvious but some locations may also be suitable for a wind turbine. Another truly renewable energy source which may be overlooked is the use of wood fuel which at first sight may appear to be completely unsuitable for eco-friendly use due to its high carbon dioxide output. It is true that, in many cases, the carbon dioxide emissions per kW from wood can be as much as four times as much as those from a modern oil-fired condensing boiler but wood has the advantage that, provided it is obtained from a properly managed sustainable source, it is regarded as being carbon neutral as it cannot put out any more that it has taken in when growing as trees. It goes without saying that our eco-friendly home must be built from materials which also do not adversely impact on the planet. This is more difficult than it may first appear and, following on from the idea of living in a twig shelter, some may feel that natural thatch may be a suitable material being completely renewable but unfortunately in the UK most of today’s thatching uses imported reeds, the costs of transportation adding to its carbon footprint. Plastics are of course based on oil and many metals have huge energy requirements in their production. Properly sourced wood is an excellent material which can be completely sustainable, eco-friendly and fully traceable using the system of FSC certification but wood does have one downside in that it is seen as having a limited life, hence the proliferation of plastic window installation companies. Wood does need to be treated against rot and the traditional methods of using creosote or copper-chrome-arsenic are extremely toxic and potentially damaging. One suitable alternative is the relatively new concept of acetylation in which softwood is treated with acetic anhydride producing a treated wood product which is extremely stable and long-lasting with truly green credentials. The best known has the trade name Accoya. There is so much to think about and know in this area. Are there any companies that provide eco friendly pre-fabs or modular homes?